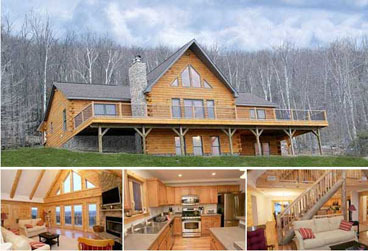 Eastern Adirondack Home and Design specializes in woodland and waterfront homes and will help you through your journey of designing, building and decorating your new log or Timber Frame residence. By using some of the very finest craftsmen and designers in North America, Eastern Adirondack Home and Design will bring your dreams into reality. Affordable quality and craftsmanship in the true Adirondack style. We also offer machine milled home packages, Log Post & Beam Homes, Timber Frame Homes, Appalachian Style Log Homes and modular log homes, offering many choices. For those seeking Green Building certification and "Energy Star" certification, all Eastern Adirondack Home and Design Modular Log Homes employ the latest in green building practices, technologies and techniques, as well as the latest standards required by the Energy Star Program. It's easy to find out more. Just give us a call, stop by, email or chat us for more information.